Welcome to Bet on Combat, the pioneer in sports investing and the utmost authority in the combat sports betting industry. Congratulations on taking the first step to creating an effective and prosperous sports wagering portfolios, either as your primary form of investment or as a way of diversifying your current portfolio. Just in case you don’t know me, I want to take a few minutes to introduce myself. My name is Franco Richard better known as Francombat and I am the Founder, Chief Investment Officer, and the largest Shareholder of the most unusual organization in the gaming sector. 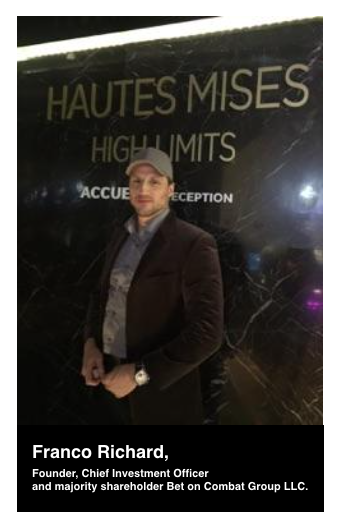 If you haven’t heard about me before, I am the guy from Montreal, Quebec who dropped out of college and started to bet his own money on the outcomes of fights and became a multi-millionaire by the age of 27. Yes you heard that right, betting thousands of dollars on combat sports. You may have heard the story how I turned $17,450 into a cool $3.7 Million dollars over a couple years (I've made more since then). Because of my success, I’ve been featured by every major business and financial media outlet and hired as oddsmaker and consultant for some of the world’s top sports books from Las Vegas to Antigua to Macau. I've also been on various radio stations, morning news shows, and television networks discussing combat sports betting. In response to the erratic nature of mainstream financial markets, I identified the opportunity to secure superior returns through the application of mainstream portfolio and investment management techniques to the burgeoning markets of combat sports betting investment, leading to the establishment of the world's premier combat sports hedge fund. In January 2010, with $500,000 as a seed capital investment, I established the Bet on Combat Capital (BOC Capital™) in St-John’s, Antigua with a view to offer investors an alternative product to shares, bonds, property and other “traditional” investment vehicles and asset classes. Under my leadership, the hedge fund has grown to nearly $3,2 million in assets under management within five years. It did not take long for investors list to grow. In fact, my hedge fund went on to become recognized as both exciting and lucrative alternative to traditional investment. In the investment business, past performance cannot guarantee future results. But, what I can guarantee you is that at BOC Capital™, your hard-earned money will never become a secondary concern. I will treat your money exactly as if it were my own because it’s my fiduciary duty for one, and two, my own money is also invested in BOC Capital™ right alongside yours. It took me more than 17 years to discover this and hundred thousand dollars in cash down straight out the window. I am now proud to say I have helped several people make $50,000, $100,000 and even over $1,000,0000 using my strategies. I hope you'll be next. With sports betting becoming more mainstream and the industry growing, and the passing of Senate Bill 443 it is now legal to create a sport betting mutual fund in Las Vegas. I want to establish Bet on Combat® as the standard. Consistently turning a profit, transparent and informative. I also want to be the leader of this marketplace and show that combat sports betting is a legitimate investment by outperforming the major stock indexes, mutual funds and Etf’s, making combat sports betting a real investment option for all. Please tell your friends and colleagues about BetonCombat.com; the more bettors and investors, the more knowledgeable and profitable our community becomes. Join over 1,000 investors in the world’s premier combat sports hedge fund and start earning your 2nd income. Remember that you always risk losing the money you bet or invest, so do not spend more than you can afford to lose. If you think you may have a problem, click here. Best of luck on your journey to become a profitable combat sports investor. Bet on Combat Group, LLC. Bet on Combat® is a pioneer in sports investing and the utmost authority in the combat sports betting industry. Founded in 2000 by French Canadian martial artist and entrepreneur Franco Richard, Bet on Combat Group, LLC is a global company that offers a full range of consulting, investing and gaming services, including their BOC Consulting, BOC Investing, and BOC Gaming. Headquartered in the Caribbean nation of Antigua, Bet on Combat™ was first established in Taiwan as an online odds comparison service then evolved into a combat sports betting consulting firm, where members are advised concerning who to bet on and how to bet them, similar to your stock broker advising you on which stock or fund to invest your money in. Exploding onto the sports investing scene in 2010, Bet on Combat® now bring's you the opportunity to invest on the burgeoning market of combat sports via its multi-sports hedge fund BOC Capital™ from anywhere at anytime in real time at your fingertips. Despite their relatively young age, BOC Capital™ has quickly established itself as one of the world’s fastest growing destinations for income investing, thus making it the number one ranked sports hedge fund company in terms of size and revenue in 2017, with approximately $3.2 million in assets and a return on investment over +196.23% to investors. This is why BOC Capital™ is trusted to manage more money than any other sports investment firm in the world. From small-time bettors to big-time whales who put six figures on the line, whether you’re speculating in alternative investments or serious about a long term investment opportunity, Bet on Combat® is your leading global destinations for the latest odds, lines movement and on all things related to the numbers around combat sports wagering. Our goal here is to centralize as much information about an upcoming fight based solely from a betting perspective and provide you, the casual and pro bettor with the tools and advices to make the most informed betting decision. Montreal is a major player both in the gambling and the professional combat sports industry of North America. And yet, there is untapped potential when it comes to the world of sports investing in Montreal. This is why we created a gaming office Bet on Combat Salon to nurture a professional environment for our sports analysts and staff, as well as the best place for fight fans to eat, drink, bet and watch fight. Powered by its own proprietary technology, BetonCombat.com has naturally became the foremost authority on odds, lines and all things related to the numbers around combat sports wagering since the site first went live in January 7th 2000. So while the BetonCombat.com website was new back in 2000, the company behind it was not, having been online doing combat sports matchups, odds comparisons and other combat sports-related functionality since 1999. In a press release, the company's founder, Franco Richard, stated: "Having our own software puts us in command of our own destiny. It means we can react quickly to customer feedback and continue to develop an innovative, community focused product. In January 2004, Bet on Combat's Founder Franco Richard announced that he'd revamped Bet on Combat into a combat sports betting consulting firm (BOC Consulting), where members were advised concerning who to bet on and how to bet them, similar to your stock broker advising you on which stock or fund to invest your money in. The first prediction recorded publicly is UFC 46: Supernatural, January 31st, 2004, where Franco Richard CEO of Bet on Combat® won $32,420.00, with 2 predictions for a total of $19,920.00. Sign up and get access to our official plays every weekend. Bet on Combat brand first entered public consciousness in 2007, when Franco Richard, then a combat sports betting consultant and oddsmaker, turned his life savings of $37,000 into more than a quarter of million dollars betting on Matt Serra to win the UFC Welterweight Championship title at odds of 7 to 1 in April 7th 2007 at UFC 69: Shootout. Unlike most of his competitors, Franco chose to market himself as a face to what was up to that point a largely faceless industry. As the face of the Bet on Combat brand, Franco’s winning reputation increased in the mid-2000s as online gaming’s popularity surged. By 2010, Franco was Asia's biggest combat sports betting consultant, with an impressive client list of 100 "high net worth individuals" whose minimum bet was $10,000. In the same year, Bet on Combat relocated its global headquarters from Taiwan to Antigua. In January 2010, with $500,000 as a seed capital investment from Francombat Companies, LLC, Franco Richard established the world's premier combat sports hedged fund in St-John's, Antigua with a view to offer investors an alternative product to shares, bonds, property and other “traditional” investment vehicles and asset classes. About 45% went to software and product development, about 45% to marketing, and the rest to miscellaneous expenses like legal fees and subscription costs for the statistics feed. Bet on Combat Investment Fund became accessible to external investors in January 2015. With Franco Richard serving as the company's CIO and pitchman, the business expanded rapidly, surpassing $3.2 Million FUM with a return on investment over +196.23% to investors since inception in 2010. Following the passage of Senate Bill 443 in June 2015, which legalize sport betting mutual fund in Las Vegas, Franco Richard establised BOC Capital™ USA for the American and Canadian market and began to accept investment to external investors. BOC Capital™ is currently licenses in Europe, Asia and North America. Invest and start earning your 2nd income. In September 2017, BetonCombat.com launched a weekly fantasy combat sports games that offers consumers multi-player and head-to-head matchups for an entry fee. Cash payouts are awarded to the player that generates the most fantasy points with their fantasy team. Bet on Combat Fantasy hosts Boxing and MMA fantasy line-ups every week and will introduce a variety of other games in 2018. BOC Capital™ began paying a dividend in 2017 and has increased its dividend payment every year since 2017. In January 2019, Franco announced that he's stepping away from his role as the Chief Executive Officer of Bet on Combat® in order to focus his time to make the traditional Lei Tai fighting a recognized professional combat sport. Despite his retirement as the CEO, Franco remain the company’s Chief Investment Officer. The Bet on Combat brand has since entered into sponsorship deals with several up-and-coming boxers, mixed martial artists and Muay Thai fighters. Bet on Combat™ also signed a multi-year, multi-million dollars deal with the new professional combat sport Pro Lei Tai™ as an official sponsor, which is planned to make its promotional debut in May 2020. The partnership was announced at a ceremony held at the Venetian Hotel Casino in Las Vegas, Nevada. As of today - Bet on Combat™ has evolved into the premier social network for combat sports gamers with a growing community of over 1500 members worldwide who share their performance and dedicated towards helping each other make money from betting on fights. Now thanks to its private chat room, combat sports fans around the world can connect and interact with each other to discuss upcoming match-ups, odds, betting tips, predicitons, news, post fights and follow their favorite handicapping experts. This means you can follow your mates and top ranked bettors, providing a very cool way to get authentic betting tips to improve your real money bets. By following winning bettors, logic implies you will become more successful. Plus, with profiles, leaderboards and monthly prizes, we make betting more fun! Start posting your picks, gain followers, build your reputation. Visit our Investing page here. Bet on Combat Group are fund managers whose investment universe centres on combat sports and events. In this nascent sector we provide unparalleled investment intelligence, funds management expertise and through the use of technology, customer service. They are comprised of former financial advisors, oddsmakers, journalists, pro fighters, and trainers, who study and analyze every fighter and every fight event to develop better information, make smarter predictions and win more money! They know what's going on inside the training camp. They know who wants it more, who's injured and who's out for revenge. They analyze upcoming match ups to find out how two fighters really compare. As Professional combat sports betting consultants, they look at combat sports betting just like buying stocks, futures, options, or investing in general. The bottom line is: they give bettors advice that are about as close as you can get to inside trading the stock market. Unlike many other investment funds, our Fund Managers have a substantial investment in the Fund - aligning their interests with yours. Franco Richard, better known as Francombat, is the Founder, Chief Investment Officer, and the largest Shareholder of Bet on Combat Investment Fund, as well as a dedicated income investor and successful entrepreneur. If you haven’t heard about him before, he is the guy from Montreal, Quebec who dropped out of college and started to bet his own money on the outcomes of fights and became a multi-millionaire by the age of 27. Starting at the age of 25, Franco broke into the gambling industry by working for one of the biggest bookmaker in Asia, where he learned all the good, the bad and the ugly being both a oddsmaker and handicapper. This laid the foundation that gave him the invaluable perspective of how lines are set, line movements, how public perception affects the line, and the ability to spot value. In 2004, Franco founded online gaming venture Bet on Combat™, a company that provides its clients with advice on who to bet on and how to bet them, similar to a stock broker advising its client on which stock or fund to invest their money in. By 2005, Franco was Asia's biggest combat sports betting consultant, with an impressive client list of 100 "high net worth individuals" whose minimum bet was $10,000. In the same year, Franco relocated its global headquarters from Taiwan to Antigua with the dream of making it big in the industry. Franco's first notable cash was in 2004, when he placed his life saving money of 17,450 on fellow French Canadian prospect Georges St-Pierre at UFC 46: Supernatural and doubled his money. He then had the $37,000 bank roll to start his combat sports betting career. Then, three year later he made international news in the spring of 2007 when he won more than a quarter million dollars ($259,000.00 to be exact) betting on Matt Serra to win the UFC Welterweight title at odds of 7-1 at UFC 69: Shootout. In response to the erratic nature of mainstream financial markets, Franco identified the opportunity to secure superior returns through the application of mainstream portfolio and investment management techniques to the burgeoning markets of combat sports betting investment, leading to the establishment of the world's premier combat sports hedge fund. In January 2010, with $250,000 as a seed capital investment, Franco established the Bet on Combat Investment Fund (BOC Fund) in St-John's, Antigua with a view to offer investors an alternative product to shares, bonds, property and other “traditional” investment vehicles and asset classes. Under his leadership, the investment fund has grown to nearly $2,7 million in assets under management within five years. Nowadays, Franco doesn't earn his money only from combat sports betting. In the business world, Franco Richard is known as the Chairman of the Board and CEO of Francombat Management, an asset management firm and holding company who owns and operates a collective investment portfolio of businesses out of Antigua. Prior to forming Francombat, Franco worked as a stock trader and venture capital across a range of industries in the Canadian, U.S. and International markets. Franco’s successful story inspired hundreds of daily emails from fans wanting to know more about him and his betting strategy. He is currently engaged in a forthcoming book project entitled “Investing on Combat Sports: Introducing the New Wall Street.” You can watch our documentary series where he tells how he went from $17.450 to $3.700.000 in profits from betting. He is also currently in the talk to produce and host a TV show called 'We are on the Fight', a weekly betting preview show where he would interviews athletes and celebrities. This journey has provided him with a great lifestyle and financial freedom. Despite his success, Franco never forgot his humble upbringing. Throughout his Unfightable Initiative, Franco give back to various charities from around the world. For more about Franco Richard, visit FrancoRichard.com. Philippe Dupuis is the Chief Executive Officer of Bet on Combat Investment Fund and Consulting Services, and brings over 25 years of investment experience including 15 years on Wall Street in global mergers & acquisitions, capital markets and investment management. Dupuis is responsible for overseeing the execution of Combat Sports Investment Fund’s strategy and management of the business, working closely with key service providers such as lawyers, auditors, betting exchanges and bookmakers. Dupuis has co-authored papers on topics including sports investing, derivatives, enhanced indexation, securities lending, hedge funds and the secret of Franco Richard’s combat sports investing acumen. He also initiated BOC’s international growth and its introduction of mutual funds as well as the creation of the “Bet on Combat learning" article series. Mr. Dupuis is a graduate of Concordia University in International Business. Jun Fa Li is the Chief Financial Officer of Bet on Combat Group LLC., and Director of Investor Relations of the BOC Fund™. Li has transferred her background in financial analysis and applied the same strategies into a “Combat Sports Investing" philosophy. She is primarily responsible for all financial matters for Bet on Combat™, including Accounting, Tax, Treasury and Investor Relations. Li is also responsible for financial planning, record-keeping, financial reporting and sits as well on the board of directors. She views each client as an investor and herself as their “Combat Sports Investing Analyst" with a singular job and thats too provide a high return on each clients initial investment. Her financial background, love of numbers, and firm grasp of what it takes to be a successful combat sports bettor puts her in a great position for future success. Ms. Li currently also serves as the Chief Financial Officer of Francombat Management LLC., an asset management firm and holding company who owns and operates a collective investment portfolio of businesses in the United States, Europe and Asia. She also serves on the Board of Trustees for the Unfightable Foundation, an independent charitable giving organization, whose purpose is to inspire the next generation to dream big, take action and encourage individuals to remain positive in the face of adversity. Prior to Bet on Combat, Li held leadership positions in the Canadian public financial sector. Li hold a Bachelor's degree in Business Administration (B.B.A.) & Finance from the McGill University in Montreal. Michael Lynch is the Chief Risk Officer of Bet on Combat Investment Fund and is the executive accountable for enabling the efficient and effective governance of significant risks and reward, and related opportunities, to the business and its various segments. His primary responsibilities are the development of combat sport-specific databases and working with the CIO and analysts to develop sports specific algorithms that can be used for primary betting and trading. Lynch also work alongside other senior executives such as with the chief compliance officer and chief financial officer, dealing with topics regarding insurance, internal auditing, corporate investigations, fraud, and information security. His main priority is to ensure that the organization is in full compliance with applicable regulations and to analyze all risk related issues. Lynch is an expert on gaming models and has published peer reviewed articles on statistical models of combat sports. His latest model was presented at the 15th annual conference on gaming in Las Vegas. Mr Lynch holds a PhD in statistics from UCLA. Stephen Arnault is Bet on Combat's Chief Legal Officer and Chief Compliance Officer (CCO). He is primarily responsible for all legal affairs and regulatory compliance within the organization. Mr. Arnault was first appointed to the Board as a non-executive director in January 2010 and Chairman of the Audit Committee of BOC Fund’s Investment Group. Mr. Arnault has extensive knowledge of international financial markets gained from experience at leading global financial institutions in a career spanning 30 years. Stephen currently serves as the Chairman of Global Holdings Limited in Los Angeles, California. Mr. Arnault holds both a B.A. in Economics and an M.B.A. in Finance from the University of California, Los Angeles. Jason Le is the leading oddsmaker of Bet on Combat™, a respected combat sports betting professional with over 15 years of experience consulting with the industry’s most successful online sportsbooks. He also served as a consultant for Lee Capital Partners and on the board of directors of the Center for Research in Security Prices at the University of Taipei. Le create line for professional combat sports such as boxing, kick-boxing, and MMA. He specializes in finding errors in the oddsmakers lines and advice the Board accordingly. His statistical analysis is beyond any handicapper in the world. That means you’ll get better odds, more exciting prop bets, and a better sportsbook experience all around. Before joining Bet on Combat, Le was pursuing a Ph.D. in applied mathematics at Washington, where his research interests ranged from mathematical physics to quantitative methods for sports handicapping. Le is also member of the Risk Committee. Le currently reside in Hong Kong. Evan Young covers the sport of professional boxing from a betting perspective for Bet on Combat. Young has a long history of success with winning client's money. Young began handicapping boxing in the late 1980’s, which included over a decade of regular Las Vegas junkets in order to get down on the boxing action. In fact, Young was providing analysis and predictions before the Internet even opened up wagering options. Young, began online gaming in the early 2000’s, and in 2005 developed one of the first Boxing handicapping sites on the internet. Since January 2015, Young, a former lawyer from Brockton, Massachusetts, works closely with Bet on Combat Founder and Chief Investment Officer Franco Richard best known as Francombat to find value bets on the sport of professional boxing. BetonCombat.com handicapping boxing expert Evan Young brings more than 30 years of knowledge, contacts and insights to bettors. Whether it's reporting on how Vegas sports bettors are picking a fight or revealing the reasons behind a sudden line move, Young has become one of the authorities on boxing odds-related news. Young is also member of the Risk Committee. Young holds a Juris Doctor’s degree from the University of Massachusetts Law School. Chad Sung is the Mixed Martial Arts (MMA) Analyst for BetonCombat.com. Born into a traditional and humble family, Sung has been a Kung Fu practitioner since his early childhood. Sung brings a new, youthful, cutting edge approach to Combat sports betting for BetonCombat.com. Sung first became interested in betting while he was still in college pursuing a finance degree. Unfortunately, Sung lost 80% of his capital by 2013 due to lack of discipline and his failure to manage his bankroll. Sung joined the BetonCombat.com consulting service in hopes of finding the tools he needed to broaded his betting style. Over the years he has learned from mistakes, had numerous conversations with industry leading handicappers and formulated his own strategy. He has used the aforementioned data to become an elite MMA Analyst in his own right. In the 2 years since becoming Bet on Combat Founder Franco Richard first apprentice, Sung has now turned $2500,00 into $104,000 in betting profits. Sung is a graduate of Concordia University in Business from Montreal. Mongkut Prasong covers Muay Thai for BetonCombat.com from a betting perspective. Born in Bangkok, Thailand, Prasong has been involved in Muay Thai since the age of 5 when his grand-father introduced him to the art of the eight limbs. At eighteen year old, he was forced to enroll in the Thai army. After a particular brutal mission, he ultimately decided to quite the army and focus on Muay Thai. Prasong first entered the world of betting in 2010 when he joined Bet on Combat as a subscriber. He now has 5 years of betting experience and plays a large role in the operation of Bet on Combat. Prasong is an active bettor and trading education advocate who splits his time between betting on fights and creating educational content for members of the BetonCombat.com community. Prasong is also one of the greatest cash game players in DFS history. Prasong hold a Bachelor degree of Communication from the University of Bankok. Richard Rider is one of the top up-and-coming MMA handicappers in the business. Rider started at BetonCombat.com back in 2015 as the website’s social media manager and within a year was given the opportunity to be a full-time handicapper. Rider is also the head moderator of the Bet on Combat chat room where he share a wealth of inside with members. Richard Rider first started betting on MMA in 2013 without having much luck in the market. Until 2015, Rider lost all of his capital several times trying different strategies. By the end of that year, looking to expand his betting knowledge, Rider joined BetonCombat.com Consulting Service and began learning Franco Richard's strategy he uses today. After just 2 weeks, he knew he found something special after seeing Franco’s consistently profitable betting. Eventually, Rider started studying vigorously and developed his own niche strategy to focus on total and propositions. Rider’s betting style is now based on total and propositions bet and he had his best year in 2015. Rider was born and raised in Belleville, Michigan, which is where he still resides. Ever wonder how you can bet on combat sports? Where can Canadians or Americans bet on Boxing or MMA? Tired of googling whether this sportsbook has lines for this fight? This is a reference guide for any questions you might have regarding betting on combat sports online. Consequently, we get dozens of e-mails each week from people asking us all kinds of stuff about what we do and how we do it. So what we've done here is taken the top of the questions that we get the most and tried to answer them as simply as we can to make things easier for you. The following section details the answers to commonly asked questions regarding how to Get Started, the Consulting Service, and the Combat Sports Investment Fund. Should you require more information please do not hesitate to contact us. What is Bet on Combat? Bet on Combat is a social network for combat sports gaming enthusiasts to share their knowledge and enhance their own betting expertise. The website encompasses a wide range of products and services all designed to help improve your betting results. The Bet on Combat Consulting Service (BOC Consulting) aim to advise casual and professional bettors concerning who to bet on and how to bet them, similar to your stock broker advising you on which stock or fund to invest your money in. We advise more than 1 million dollars worth of combat sports betting plays every week. For more information, please visit: BetonCombat.com/consulting. The Bet on Combat Investment Fund (BOC Capital) caters to people who do not follow the combat sports but wishes to invest in the combat sports Investment Fund because they recognized our proven high returns profitability.The BOC Capital™ pool funds from investors and wager on combat sports markets, similar to investing in any other financial market via a mutual fund. We provide alternative investment to hundreds to new investors in Canada and around the world and manage close to 2 million dollars in capital net worth from our investors. For more information, please visit BetonCombat.com/investing. Bet on Combat: The Game is the world's first Fantasy Combat Sports Pick'em from the World's leading combat sports gaming brand. Bet on Combat® is a community of sports fans that love to make picks on fights. We've all watched a boxing match or UFC event with our friends and there's always a guy who thinks he knows too much about the outcome. With Bet on Combat®, you can show your skills or get an edge by following other predictions. Build up a winning record and you'll gain fans of your own. We know you have a strong opinion about who win the fight and Bet on Combat® is your voice to prove how good you really are. For more information, please visit BetonCombat.com/gaming. How to Bet on Combat sports? To Learn How to Bet on Fights, you can read our Free Betting Guide right here. You can also buy the book "Investing on Combat Sports: introducing the New Wall Street”. You will find Bet on Combat Founder Franco Richard's personal Strategy, tips and much more. Why can I never find your book in any bookstore? Because bookstores are horrible places to sell books—30-40% of all books are returned and the margins bad. The book is available exclusively online at Amazons because online selling is the future as it’s much more efficient and profitable for publishers. If you're looking for a place to bet on combat sports, consider signing up through us at BetonCombat.com/Bookmakers. Join today to take advantage of all our great offers. Our many years of experience guarantee you a superior betting service. You can follow all the opening Boxing, Kickboxing and MMA betting odds at the biggest sports books in the industry on BetonCombat.com’s Live Odds page. Bet on Combat not only keeps track of all the combat sports betting lines and betting odds but also monitors sharp and steam lines moves, giving you instant access to live odds from 20-plus reputable sports books, all handpicked and certified as reliable outlets by Franco Richard himself. Should I have more than one sports book? It certainly doesn't hurt to have accounts at multiple books. In fact, that's a great practice of a professional bettor: it allows you to do what we call line shopping (aka looking for the best price on a given event). Serious bettors will likely have accounts at 4-5 books or more. For example, one book might find Sean Salmon at +500 on one site (meaning for every $1 risked you would win $5) and +450 on another ($4.50 for every $1 risked). You'd obviously want to shop and get the best price, namely the +500 line. Otherwise you're just leaving money on the table. Can I wager on other sports? Do you guys get a "kickback" of any sort from Sportsbooks or any other advertising entity at this site? Absolutely Not. We have no partnerships, endorsements or sponsorships with any sportsbooks in any way, shape or form. We intentionally avoid those types of relationships due to the inherent conflict of interest they present. So, any sportsbooks display on BetonCombat.com are for information purpose only and their odds through a purchased syndicated feed. Thousands of bettors have enjoyed betting on sports via the internet. The sport books we recommend have paid out millions in winnings. Remember these sportsbooks are not fly by night businesses looking to scam a few thousand dollars from one person. This is a billion dollar industry and they have all built there business on gaining your trust and the trust of big players. Each one has at least a decade of history behind them and you should feel secure moving your money in and out of any of these books. Registering with Bet on Combat is free, quick and easy. To sign up and become a member of Bet on Combat click here. Once you have registered, use the side navigation bar to browse through our services. If you are looking for betting tips you should head straight for our consulting section. If you are looking to improve your betting knowledge, both beginners and more experienced bettors will find something useful in our betting academy. Also make sure you visit the Most Comprehensive Fighter Comparison — a valuable statistical database on every single fight match-up on planet earth, helping you predict the outcomes of fights and improve your betting chances. Visit our bookmaker for detailed info on a wide range of online services catering for your betting needs and, of course, post your own predictions to compete in our popular monthly tipster competitions. In addition to other exclusive content and services. Why joining Bet on Combat Community? • Discover your favorite tipsters and follow their predictions. • Exchange information with other users and together beat the bookies. • Publish your own predictions, track your progress and get valuable feedback from other bettors. • Find trustworthy bookmakers by reading our impartial reviews. Do I need to post predictions to use Bet on Combat? No. Posting predictions is not a prerequisite for using other services. If you have signed up to Bet on Combat you are under no obligation to join the conversation in the chatroom, participate in any competition or use any other service we offer which you are not interested in but remember all current tips are available for everyone to view. You can adjust your profile settings by entering ‘settings’ from your profile icon in the top right hand corner or by clicking here. Bet on Combat is designed to be a betting community therefore we encourage our users to stick to their usernames so people become familiar with other users but if you really must change your username you have to send us a request. It can take up to a week to change however so be patient. A Bet on Combat verified profile is a recognition that is given by Bet on Combat, which means that the profile is authentic. The verified profile contains a gold badge beside the name of profile. To become a verified profile you must first prove that you are a real individual. If you think your account should be verified, let us know by email. A verified badge does not imply an endorsement by Bet on Combat. It is possible to delete your own profile. To do this go to your settings and select the delete tab. You will be prompted for your password to confirm the request which will remove all tips placed under that username. Once a profile is deleted, it cannot be retrieved. How do I post predictions? To post tips you must first register with BetonCombat.com. Then click on ‘post tip’ in the top right corner of the Bet on Combat website. On the first screen of the post tip form you can select your event by either manual search or begin typing the teams/players involved and select from the drop-down menu. Once you have found your desired event proceed to the next screen where you can input the details of your prediction. Select your bet category, bet type and other prediction specifics. Note: some options only become available when selecting certain bet categories and bet types. Next you must select your desired stake. Odds are automatically added once your tip has been entered, with the highest odds at the top of the list. The final stage of post predictions to support the prediction with an analysis. See the sections on analyses below for more details. The final screen is a confirmation of your tip. For full details about the rules of the tipster competition click here. What happens if I make a mistake in my prediction? e.g. I selected the wrong bet type. You should always double check your predictions before you submit them and you should consider our predictions as you would if you placed the same bet with a bookmaker -- would you expect the bookmaker to change your bet after it was placed because you made a mistake? Can I delete a prediction? Tipsters are not allowed to delete predictions and even if you claim a mistake was made, predictions will not be deleted by Bet on Combat unless it is under extreme circumstances, for example, we suspect cheating. Similarly, and for obvious reasons, predictions cannot be deleted after an event has taken place. Eliminating the prospect of deleting predictionhs also helps us achieve our golden rule of transparency ensuring that all information that appears on bettingexpert is made in good faith. Please be certain your prediction is correct before you post it. Do I have to manually update results of matches? No. Our new post prediction system automatically updates the results of events so once you have placed a prediction you don't have to do anything further. Note: in rare circumstances, such as rare bet types in smaller markets, events might not be automatically updated and will either have to be manually updated by the tipster or by Bet on Combat. Can I post tips in different languages? You are allowed to post tips in different languages but please note that predictions will only contribute towards that language’s respective competition. The exception to this is the Tipster of the Year competition which is awarded to the tipster that generates the most profit over a year in all tips posted regardless of the language the tips are posted in. Can I post the same tip in different languages? No, you are not allowed to post the same tip twice even if it is in a different language. Previously, tipsters were able to translate tips so they were available for different however the rules have changed now since the introduction of the new post tip system so that translations are not enabled any further. Am I allowed to post more than one prediction per match? Tipsters are permitted to post more than one prediction in the same match, however, the predictions must be in different markets and the combined total of the stakes for that match must not exceed 10. The purpose of this rule is that tipsters are unable to stake more than 10 on any tip but also allows them a bit of freedom to tip on other markets. The same rule applies for tips placed on the same event but across different languages - the total tip on any one event across all languages must not exceed 10 units. Please remember that if you do decide to post predictions on multiple markets of the same event, the analyses must be different and relevant for that specific prediction. This means for example that if you wanted to post an 8-unit tip on a home victory for a particular event you are not allowed to post more than 2-units on a different market in the same event. This would take the total to 10-units. Note: this would not count as a 10-unit stake and will not contribute to the 10% rule for 10-unit tips. There is an exception to this rule in Golf, Horse Racing and Motor Sports whereby tipsters are allowed to post up to 10 units on a win market in addition to a further combined 10 units in any other markets other than the win market. The reason for this exception is that these single events feature many competitors and so we don't want tipster to be too restricted in these markets which can sometimes only happen once a year. Why can’t I place a tip less than 30 minutes before an event? We want to give users browsing tips enough time to make an informed decision about whether to follow a tip before the event begins. What do I do if I see a mistake in a tip? If you think a tipster has made a mistake in a tip make sure you report the tip to us using our Report Tip feature found in the top right hand corner of the respective tip's page. There are several options to choose from or alternatively select the 'other' category and manually input what you think is wrong with the tip. What do I do if I suspect a user is attempting to cheat in their tip? If you suspect another tipster is cheating or gaining an unfair advantage then please report them immediately here. Please be aware that it is not a good idea to publicly accuse other tipsters of cheating particularly if you don't have sufficient evidence to support your claim so always give them the benefit of the doubt. We appreciate all the help we can get from our community in regulating tipster behaviour. We built Bet on Combat Chatroom as a way to introduce measurement, accountability, transparency and data-driven optimization into the betting world. In order to demonstrate transparency and accountability, communications should be clear, easily accessed, and kept up-to-date. Our inspiration came from Franco Richard trying to help his students bet better when he realized detailed performance data helps people focus on what works best for them thus making them more profitable. Academic studies suggest 95% of bettors lose longterm and 70% of professional mutual fund managers fail to beat the S&P 500 each year and yet there remains thousands of "gurus", bettors and handicappers who claim online to be consistently profitable. But who is actually profitable? It's time to put up or shut up. Just like Investimonials does for financial products, BetonCombat.com aims to discover the best bettors and investors and weed out the worst. How do I know you didn’t just make those statistics up? Easy. You can follow the site for a while and see for yourself. We sell our plays in long-term packages, anywhere from 1 month to 1 year. If we were to lie just once about our results, we would lose every single long-term customer. Thus the members of this site are collectively the best monitoring service in the business. We want your business long-term, which is why we will never give you exaggerated or false records, ever. Why do so many bettors, handicappers and "gurus" lie about their performance? The gambling industry will always have its share of weasels, degenerates and losers, but we prefer to focus our precious time and efforts on those who are not necessarily always successful, but who always want to learn from losses and mistakes instead of pretending they don't exist or covering them up with lies. Everyone, even legendary investors and traders, endures losses every now and then; we have already learned from the top bettors and gamblers in the Chatroom that the key to successful long-term performance is by focusing on minimizing these losses. Most successful bettors realize this game is a marathon not a sprint and the sooner you begin analyzing your own and other people's profits and losses in detail, the more successful you will become. Why should people share their profits and losses openly? Trillions of dollars are spent each year on management fees, subscriptions, DVDs, newsletters and coaching on people claiming to be consistently profitable, but academic studies and experience teaches us trusting anyone in this industry is very dangerous. You can help make this industry transparent and great. There are honest and consistently profitable bettors and handicappers out there, we just need to find them. Why does Bet on Combat Chatroom have its share of critics? Our founder Franco Richard has made more than a few enemies exposing fraud and misinformation in the betting and online handicapper industries so people will rip on any and all of his projects. We've gotten used to that... and his attitude problems... and we remain focused on our goal of true betting transparency to improve not just individual bettors, but the entire malfunctioning industry called gambling. Why has nobody thought of this before? It is not in anybody's business interest for the online sports betting industry to be fully transparent. And that's what we're hoping to accomplish--to cut through all the BS and weed out the incompetents and liars... because that mission is just and right. How does Bet on Combat weed out liars? The community can weed out those who they think are lying and you can now post screenshots of your bets or even verify them via our bookmakers import feature. We will not tolerate liars and frauds on our site, they can go post on other websites that tolerate such behavior. If you don't believe a bet, click this Madoff icon and it will be noted... this makes the Bet on Combat community self-policing. Bet on Combat members can rise above such suspicion by using the broker connect tool to verify their trades, thus wiping away any doubt that their trades are real. Is it a conflict of interest for Franco Richard to both own the site and be on the leaderboards? No, because Franco shows all of his bets just like everyone else. He is the reason Bet on Combat exists and he exemplifies the kind of brutal honesty and transparency to which all bettors and handicappers should aspire. BOC has a 100% transparent & verified results policy. This means that all SPS picks are submitted to, tracked and verified by an independent 3rd party handicapping monitor. This is a true measure of excellence in the sports betting industry where false claims and misleading advertisements are rampant. Most services do not display past performances simply because they have a poor record. Those that do, often either fabricates their results (or) data mine their results showing only past wins. Only long term profitable services such as SPS displays all past picks and are willing to be monitored by a 3rd party! Our renowned blog featuring well known combat sports writers, and of course, the hugely popular tipster competition whereby members compete for monthly prizes based on their ability to predict the outcomes of fights. Tips placed by tipsters for the monthly competition are available for anyone to view which means that you can be safe in the knowledge that they are serious tips allowing you to make an informed decision of which fighter to invest your money on. In our blog, you’ll find profound combat sports betting related analysis of the some of the world’s leading betting experts. We want to collect and share great betting knowledge on the blog in order to educate our users and ultimately to achieve Bet on Combat's goal: to improve your combat sports betting from an investing perspective. Who is writing on the blog? Both members from our staff and guest bloggers are writing for our blog. Can I write for the blog? Our blog is written by highly experienced combat sports betting writers and to keep the standard high we only let very high quality writers post on the blog. If you genuinely feel you have something special to offer or are an expert in your field and would like to write for our blog, please send us a message. How can I work for Bet on Combat? We're proud of our team and continue to search for exceptional talent to help us stay ahead of the fight game. You can see our currently advertised jobs here. If you have questions or suggestions for website additions or subtractions, if you spot an error or if you just plain don’t understand something, please send us an email at info@betoncombat.com. We’ll do our best to get back to you.